Raumfahrt+Astronomie-Blog von CENAP - Blog: Mars-Chroniken - Could Volcanic Activity Allow Water Beneath the Martian Polar Ice? A view of the south pole of Mars, where ice may hide volcanic activity. 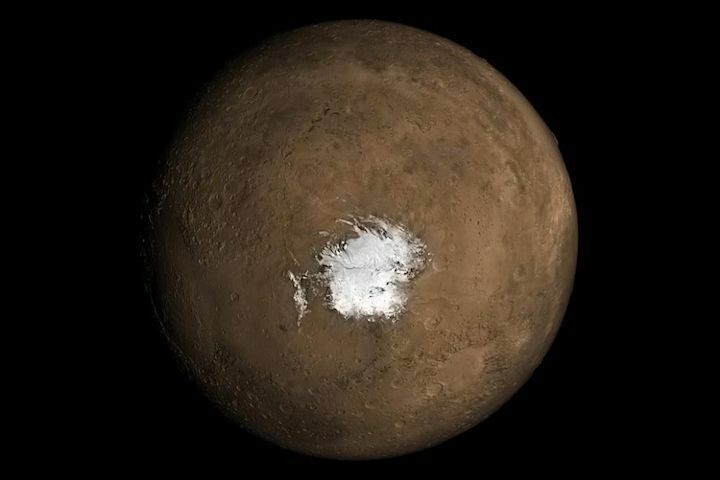 If liquid water indeed exists under the south polar ice cap of Mars, it has to be due to volcanic activity, a new study suggests. The researchers behind the new work argued that there needs to be an underground source of heat to melt ice under an ice cap — although they didn't weigh in on whether that liquid water (or the volcanic heat, for that matter) actually exists on Mars. The new study follows up a controversial finding published in the journal Science last July, in which a European Space Agency orbiter, Mars Express, spotted signs of what could be a slurry or a liquid-water lake under the polar ice. At the time, the idea was that a high concentration of salt could keep the water from freezing despite Mars' chilly temperatures. What's strange about that finding is that NASA's Mars Reconnaissance Orbiter didn't see any sign of a lake, even though that craft's ground-penetrating radar vision should theoretically be able to spot such a feature. If volcanic activity is happening on Mars, scientists say it's a strong sign that Mars is active — and a good omen for finding life on the Red Planet, as well. (A new NASA mission called InSight is examining the possibility of current volcanic activity on the Red Planet, but the instrument only just deployed its seismometer shield and results will be months or years in coming.) Life would require a source of water, a source of energy and some sort of protection from the radiation bathing Mars. "We think that if there is any life, it likely has to be protected in the subsurface from the radiation," said Ali Bramson, the paper's other co-lead and a postdoctoral research associate at the Lunar and Planetary Laboratory, in the same statement. "If there are still magmatic processes active today, maybe they were more common in the recent past and could supply more widespread basal melting. This could provide a more favorable environment for liquid water and thus, perhaps, life." On Earth, it's common to see liquid water under ice sheets, but scientists know why this occurs: because our planet produces enough internal heat to melt ice that rubs against the Earth's crust. But Mars is much cooler than Earth; it is farther from the sun and smaller than our planet, so it generates less internal heat. On Mars, it's unclear what phenomenon could melt its two polar ice sheets, which are each a couple of kilometers thick. In the new paper, the scientists discovered that salt alone couldn't raise the temperature of water high enough to melt ice if salt is nestled underneath the ice cap. So, an additional heat source is required — hence, the volcanic idea. Perhaps, the paper suggested, magma flowed from the inside of Mars to near the surface roughly 300,000 years ago. The magma didn't erupt, but instead pooled in a chamber just underneath the surface. Over the eons, this magma chamber gradually cooled off and the evaporated heat melted the ice at the bottom of the south polar sheet, this scenario continues. Mars hosts numerous old volcanoes, including Olympus Mons, the largest volcano in the solar system. But there's no compelling evidence showing that these volcanoes are active. In fact, many scientists argue that volcanism on Mars could have stopped millions of years ago, according to the journal's statement. Jack Holt, a planetary scientist at the University of Arizona, said the paper does address one reason why water could exist under the south polar ice cap. However, Holt, who talked to the authors before they submitted the new paper for publication but did not take part in the research, added that more research is required to better narrow down the answer. "I think it was a great idea to do this type of modeling and analysis, because you have to explain the water, if it's there, and so it's really a critical piece of the puzzle," Holt said in the statement. "The original paper [about the polar water find, in Science] just left it hanging. There could be water there, but you have to explain it, and these guys did a really nice job of saying what is required and that salt is not sufficient." The new research is described in a paper published yesterday (Feb. 12) in the journal Geophysical Research Letters.